Pursuing every angle and refusing to surrender the belief that his daughter is still alive, Caitlin’s father struggles through the mountainous terrain, prodding both his son and the local authorities to keep up the search. It is through a most unlikely source, however, that they finally find an answer, in a climax that is stunning in both its execution and resolution. Written with precision and elegance, Johnston captures characters’ emotions, divergent thoughts, and moments of bleak loneliness as they search for answers. Descent is both a taut and gripping thriller and a work of outstanding literary merit, a combination of great story and beautiful writing that is certain to garner comparisons with the work of such bestselling writers as Cormac McCarthy and Dennis Lehane. 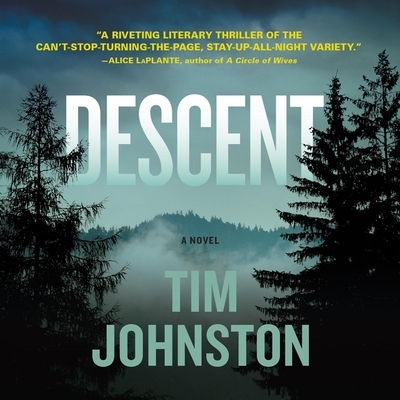 TIM JOHNSTON is the author of The Current, as well as the bestselling debut adult novel Descent, the story collection Irish Girl, and the young adult novel Never So Green. Published in 2009, the stories in Irish Girl won an O. Henry Prize, the New Letters Award for Writers, and the Gival Press Short Story Award, while the collection itself won the 2009 Katherine Anne Porter Prize in Short Fiction. In 2005 the title story, “Irish Girl,” was included in the David Sedaris anthology of favorites Children Playing Before a Statue of Hercules. Johnston’s stories have also appeared in New England Review, New Letters, the Iowa Review, the Missouri Review, DoubleTake, Best Life Magazine, and Narrative Magazine, among others. He holds degrees from the University of Iowa and the University of Massachusetts, Amherst. He lives in Iowa City, IA. R. C. BRAY has performed Off-Broadway in New York City, at the Edinburgh Fringe Festival in Scotland, and many stages in between. In addition to audiobooks, his work is heard in promos for The Biography Channel, A&E and CNBC. He lives in New England.